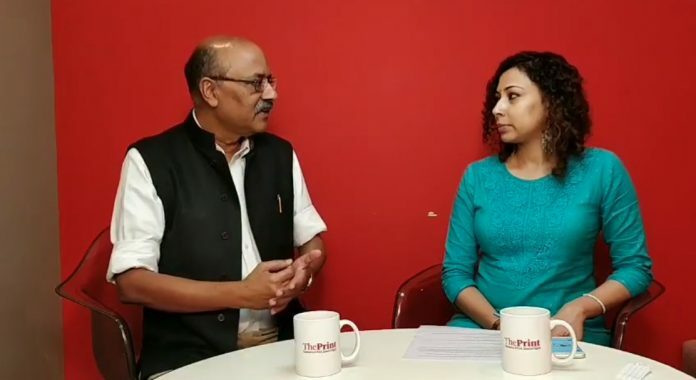 Edited transcript of the Periscope and Facebook Live conversation between ThePrint Editor-in-Chief Shekhar Gupta and Associate Editor Ruhi Tewari on the first anniversary of demonetisation of high value currency notes, on what it achieved. Ruhi Tewari: In your National Interest column on demonetisation, you said “the original promise of demonetisation has evaporated”. Why do you say so, and do you agree with it even now? Shekhar Gupta: Well, the reason I said so very soon after demonetisation was that the original promise was that a lot of this money will not come back, and people who have black money will suffer. But within a week, when you saw the pace with which the cash was coming back, you knew that promise was lost, and that promise was fantasy. This is what I then called and even now call, ‘jadoo economics’, or you can call it ‘voodoo economics’. This is like babas doing economic ‘boom’, you know something will come out. Baba Ramdev and others, when they talk on the stage, it’s okay; maybe it gets their supporters enthused. But for a sovereign government of such a large economy to do something on total faith and anecdotal evidence was quite a disaster. But having said that, I will also maintain what I said immediately after demonetisation which is that, in fact, when proven right, you must always flaunt it. I said this will be an economic disaster, this will not achieve any of the objectives which have been promised, but it will be a political masterstroke, because people like strong leaders, and had been fed up of having a weak PM for 10 years. They thought finally somebody was taking the war to black money, and taking big risks. And if in pursuit of those big risks and big objectives, he was asking us to pay a little price or make some sacrifices, we shall happily do it. RT: It started off as an economic disaster but it was a political success. The Uttar Pradesh elections also proved that. Do you think it still holds true, now that people have seen the negative impact of demonetisation on the economy? SG: Well, it will not have the same value politically as before, but I still think it has some value. First of all, nothing remains static in politics, so either something with political capital increases its value or declines. I would say it has declined to some extent, but not so much that people say “oh, we were fooled”. Some are saying it, in fact, many are saying it. But a large number are saying, “give him a chance”. Or “if he did it, he did it with the best intentions. Maybe he’s got something, so trust him”. The fact is Mr Modi’s popularity is still very strong, and a lot of it has impact. Right now, he may be able to ride it out, but if the economic decline continues and jobs don’t come back, let us see what happens next. RT: Given that 99 per cent of the demonetised currency came back to the Reserve Bank of India, according to its own annual report, were any of the objectives met? SG: I think the only thing that was achieved was, a point was made. Despite what we think – that we are an anarchic nation, we follow no law – when we Indians are given a firm order, we follow it like sheep. You can now see why so many aliens came and ruled us for so many years; when a strong leader blows a whistle, all of us fall in line. And that’s precisely what happened. But on a more positive note, I think it shows that by and large, the people of India really want to do something about corruption and black money. So much so that even if you throw ‘jadoo economics’ at them, they will give you a chance, and they’ve given the government a chance. Mr Modi’s advantage is that he’s a very good communicator. It’s not just his skill with communication; it’s also the sincerity with which he comes across, that people think, “yeh hamare liye hi kar raha hai (he’s doing this for our sake)”. RT: This has been a politically polarising exercise. Rahul Gandhi today tweeted saying “demonetisation is a tragedy” and Finance Minister Arun Jaitley on the other hand said it was a “watershed moment for the Indian economy”. Where do you weigh in on this? SG: Well, this is politics, so each one is entitled to their view. I would repeat what I said. Economically, the move made no sense. It caused damage to the economy. You may say the damage was transient, but no loss of growth is transient. Particularly from the informal sector, it doesn’t come back. What is lost is lost. It’s like in a T20 match if you play two maiden overs, you can play catch up, but you’ve lost those two overs. So we’ve lost one financial year, say about one to two per cent possible growth because of this, and that will not come back. But politically, again, because it’s all about politics, whatever Rahul Gandhi might say, this was a brilliant move, it worked well, and it is still continuing for some time. I haven’t seen the government field so many ministers, the entire establishment, to support a drastic and dramatic measure, maybe since I was a teenager and the Emergency was declared. They even got Vinobha Bhave to declare Emergency as ‘anushasan parv (festival of discipline)’. Similarly, demonetisation also became a national festival. The world is now polarised. If you see the poles in America, Trump’s ratings maybe falling when it comes to the entire population, but when it comes to Republican voters his ratings are quite high. So, voters now allow their own quite a bit of leeway. RT: @399roy on Twitter comments: “Yes objective has been fulfilled, objective of converting black money into white has been fulfilled.” Did this happen? Was black money converted into white money? SG: Well, most certainly, all black that was in cash. First off, not all black money is in cash, and not all cash is black money. There are large sections of our economy which work in cash. I think Rahul Bajaj wrote this for ThePrint. Even in America, you mostly pay a restaurant bill in cash. So there is no way that all the cash that came to banks could be tracked as black money. We have to face facts here. The expectation was that at least one third of the cash will not come back, but almost everything came back. This created an arbitrage for black money holders, for people who could convert black into white. So black has become white. Second thing, where is the counterfeit currency? This whole mythology that billions and billions of dollars of counterfeit currency is floating in India and once that goes we’ll step into a different era, it’s all gone. In fact, fake currency found is almost nothing. So the idea that this will vacuum all the black money – there’s mythology now going on that so many lakh people have so many lakh deposits, so we’ll go after them financially – that is gone, and notices are going, and more will go. But when notices go, people also have expectations. If, after doing all this, you recover Rs 15,000-18,000 crore of money, which may be taxable, and if you win all those cases and collect all that tax with penalty, you will still earn about Rs 7,000-8,000 crore, which doesn’t cover half the cost of printing new currency. So let’s forget any perceived economic benefit. Because to say banks have this money, banks can use it is too clever by half, because banks don’t have this money as capital, they aren’t just giving away this money. They have it as borrowings, because when you go and deposit your cash in the bank, the bank has borrowed it from you. First of all, the bank has to pay you interest, and in an economy where no one is borrowing, banks are strapped with this liability, because they have this cash which they have to service so they have to pay interest on it, it’s not firing up the economy because if that was the case, credit offtake would have picked up in India. SG: Well, some unconventional things have been done in the way this decision was taken. It was already taken by the Prime Minister, sanctified by the cabinet on short notice, and some preliminary paper work had been done very confidentially at the top level of the RBI. But this was a decision of the government. It doesn’t matter even when someone gives you a big government job, your appointment letter is not signed by the President of India, it’s signed by some under-secretary on behalf of the President of India. Who signed it, doesn’t matter, this was the PM’s decision. SG: It most certainly isn’t an economic stimulus activity. It is a political stimulus activity for the ruling party. See, once again, just taking away cash in people’s hands, it’s everybody’s cash, to take it in the bank, to give out and just change the colour of the currency from, say purple to now pink, yellow, doesn’t mean anything. It was just a great show of strength and decisiveness. RT: Finally, there are all kinds of currency notes now, what is the problem with the thousand rupee note? SG: That’s my one wish on the first anniversary of demonetisation, I hope I will not have to repeat it next year. You have a Rs 2,000 note, Rs 500 note, Rs 200 note, which is an innovation like the Rs 2,000 note, you have a Rs 100 note, Rs 50 note, why not a Rs 1,000 note? Is there some kind of a war on the decimal? From whatever I read these days, it looks like zero, decimal, fraction, everything we invented in vedic times, we don’t accept the claim that the decimal system came from the Arab world. Particularly, the decimal is ours, then why not a Rs 1,000 note? People say “oh, soon the Rs 2,000 note will disappear” but we don’t know what will happen. We also heard about Rs 2,000 note having a nano chip in it so, maybe right now, the nano chip is being manufactured and will be inserted not in the Rs 2,000 note but in the Rs 1,000 note. So wait for that!